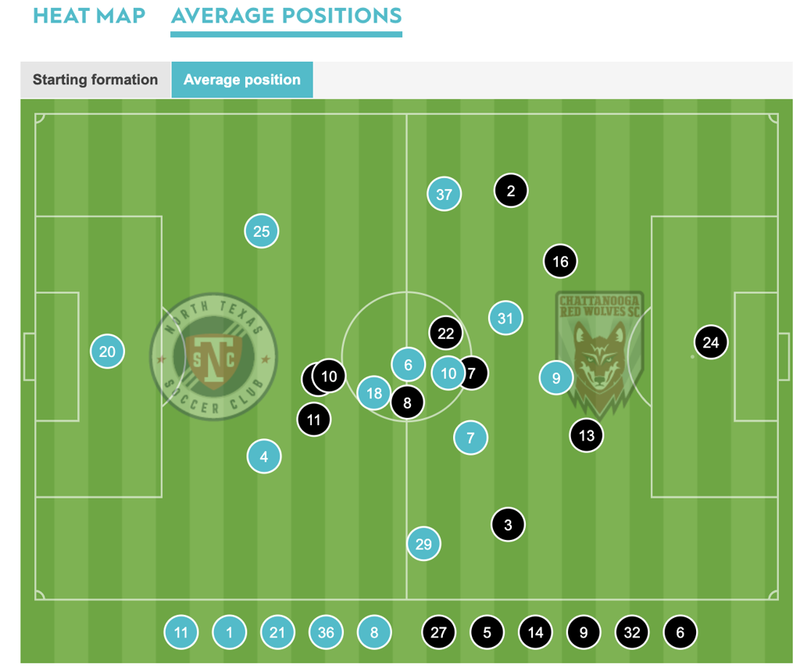 After receiving positive reaction to our short tactical analysis after last week's season opener, we've decided to experiment with a tactics article this week ahead of our match against North Texas SC. Give us some feedback and let us know what you think! 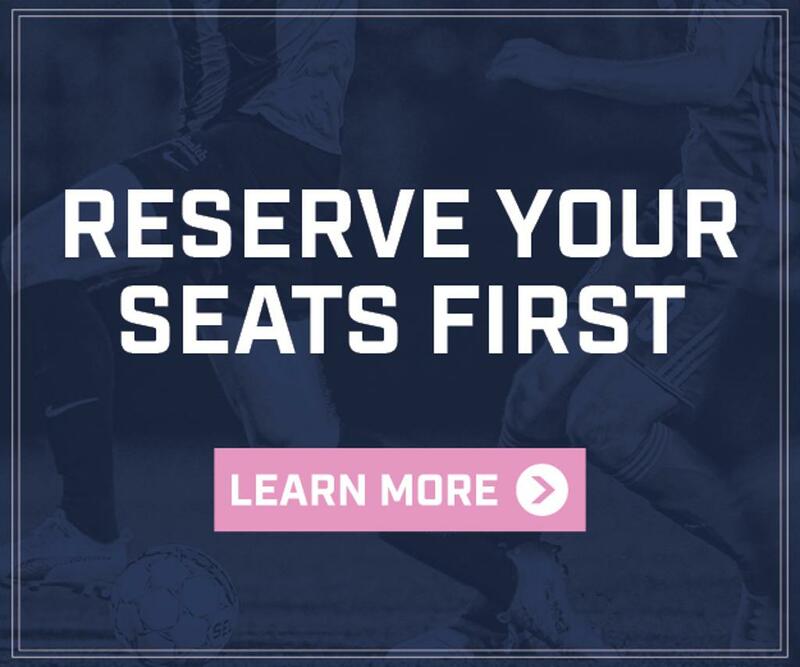 This Saturday, Forward Madison takes on North Texas SC at 9:20 (!) p.m. CT in Frisco, Tex., with the club's first goal and first points on the line. North Texas won its home opener two weeks ago, running up a 3-0 lead on Chattanooga Red Wolves SC before conceding two late goals. 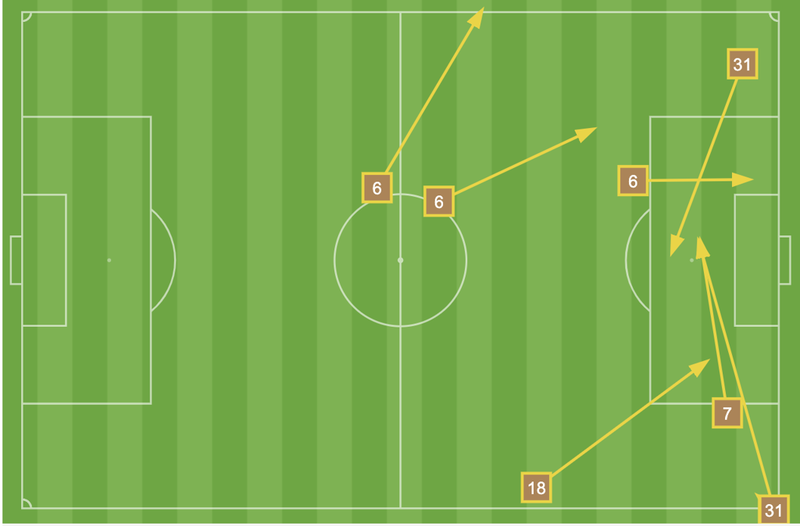 Going back through the USL Match Center from that game, we've identified ten tactics to watch for from North Texas this week. The average position map from North Texas' season opener shows us that, very roughly speaking, they (the blue dots) will line up with three players up top, three in the middle, and four on the "defensive line," although obviously both fullbacks push up quite a lot. We'll get to that in a moment, but for now, let's focus on the midfield trio, which looks like it's extremely tight together. This is very misleading, though, because in this case it meant the players were splitting time equally between the right, center, and left sides of the field. On Saturday, you should look for those three midfielders to spread out across the pitch during the match and fill gaps when space opens up. North Texas SC head coach Eric Quill resembles FMFC manager Daryl Shore quite a bit in the fact that they both try to push their outside backs into the attack. 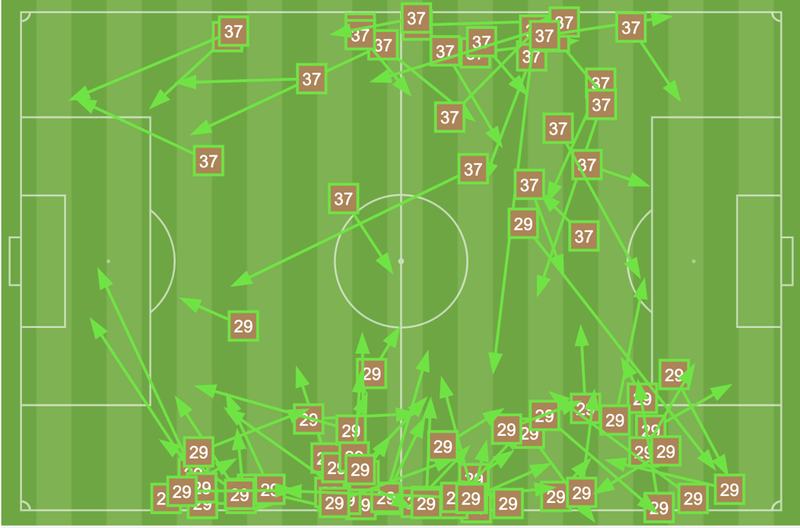 This pass distribution chart shows that Quill takes it to a near-extreme: his left and right backs are far more important going forward than they are defensively, and spend much more time near the opposition goal. When the center backs shift wider to cover for the advancing fullbacks, it falls on the shoulders of the defensive midfielder to defend the middle. Last game, Brandon Servania attempted three tackles (losing two) right at the edge of his own area, where central defenders would usually be. If Forward Madison can counter-attack quickly, they might be able to force one-on-one situations with Servania before the center backs have time to recover. Okay, so maybe that's not entirely true, but North Texas' #10 was certainly given more freedom to roam than anyone else on the pitch. This strategy is usually employed with very creative players, allowing them to create more opportunities to get their feet on the ball, which they can then do their creative things with. It's unclear if Jimmy Maurer will play this weekend since he's also a member of the FC Dallas senior roster, but regardless, it looks like North Texas' goalkeeper will not try to play a lot of long balls. Distribution is short and safe, intended to keep possession and build from defense. One of Forward Madison's more pressing tasks this weekend will be to slow down 16-year-old phenom Ricardo Pepi, who scored all three goals for North Texas in its opening match. 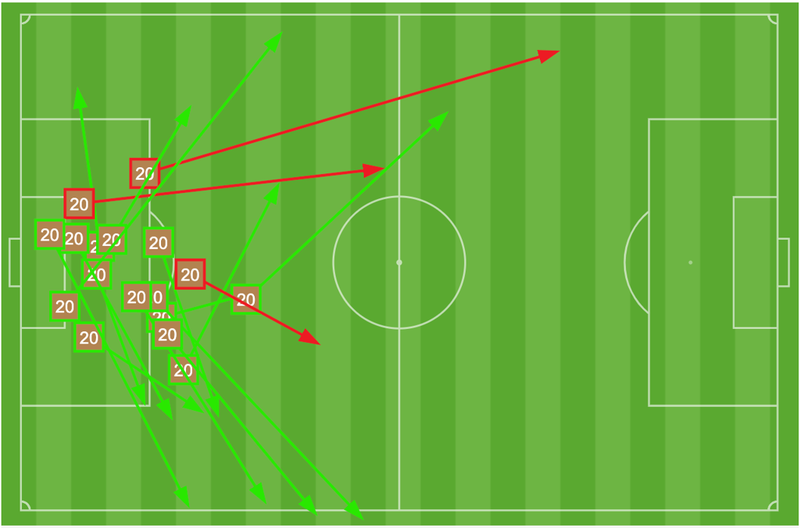 To limit his scoring chances, FMFC will need to find ways to limit Pepi's time in the penalty area, where he seems to enjoy shooting the most (see his shot chart on the left). One strategy could be to employ a high offside trap to force Pepi nearer to midfield, but Pepi has the speed to beat the trap to chase a long ball played past the defense. It's a tough decision. Coming out into the second half last game, Quill made an interesting adjustment to his team, moving Oscar Romero from the right wing to the left and Dante Sealy from the left to the right. It shows that North Texas is willing to be fluid with its positions, perhaps to confuse defenders or maybe to give players different looks. By now, this makes sense. North Texas focus on moving the ball out wide before crossing it in once they get into the final third of the field. 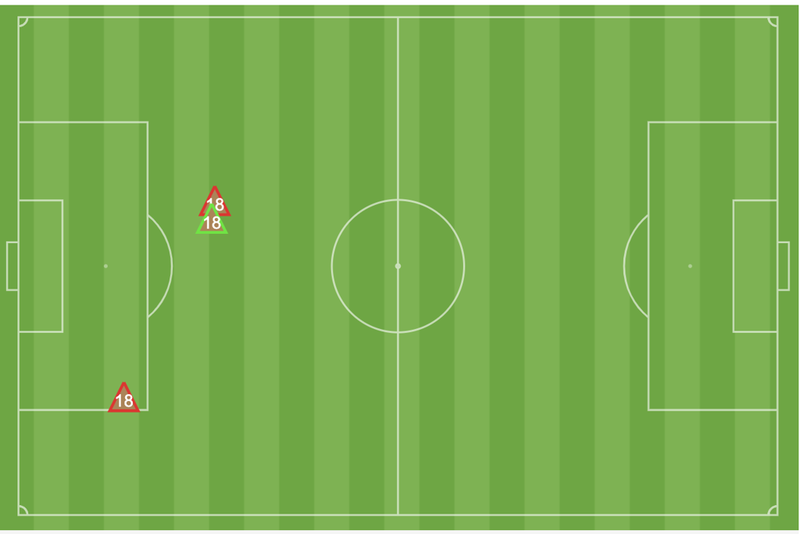 You can see here that the majority of the team's "Key Passes" (passes that lead to shots) came from the wide areas. North Texas held over 60 percent of possession against Chattanooga Red Wolves, and will likely try to do it again against Forward Madison. The team's short-pass build-up play lends itself to a high-possession style, and it will be interesting to see whether FMFC cede much of the ball to allow room for counter-attacks.